The Best Thanksgiving And Harvest Centerpieces! Quick And Remarkable! THE BEST CENTERPIECES! QUICK AND REMARKABLE! Centerpieces! We love gazing at them, admiring them…but most of us have no idea how to come up with one. The honesty of it all, is when it comes to our centerpieces, most of us put anything out and usually a single candle will do very well for us. Plus most of us just use our fine china and crystal as the decorative centerpiece anyway, because we haven’t found that special, quintensial piece. It’s not that we are ambivalent in our search, just maybe a little directionless. But why don’t we spend a moments more time thinking about a centerpiece? It is a truly a great part of the table dressing, and they do make us very happy. After all, there is more to our table than what will soon be devoured and soiled! Last Thanksgiving, we showed you how to use those lovely orange squashes, more commonly known as pumpkins, as serving bowls; which are also a great way to adorn your table in an unforgettable way. We’ve also shown you how to dry all types of harvest gourds, which would make some wonderful center pieces. This year, we are going to make some very easy and memorable, centerpieces. Ours of course will be geared towards our lifestyle…fast, easy, reusable, and remarkable. After the crystal, china and linens have all been laid out, there are many different ways to adorn your table. One easy way is by using things around the house. Another easy way is to go to your favorite craft store; ours was M…….s. The best part about going to the craft store this late in the season was that everything was on sale, because the avid crafters have a real jump on the seasons! Now, a sale fits our budget, and if we find one or two pieces off sale, we can still manage that within our budget. Or you can just step outside with a pair of small shears and have at it, too. The choice is very personal. For this Thanksgiving and harvest season we’ll just start collecting some beautiful and common things, as we do not want to make this a huge project, just a memorable one. Our on-sale, bird and little nest. Let’s warm up our creative selves with something easy and in the middle for our café or card tables. Take your hurricane lamp or posy bowl along with one votive candle and some decorative planter marbles. Place the marbles gently in the bottom of the posy bowl. Gently glide the votive candle into the marbles. Place some leaves or juniper cuttings on top of a fabric doily; then place the bowl on top of this. Et voila! Simple, elegant and decorative. Let’s move on to a taller centerpiece using a wide mouthed, vase. Let’s take our citrus, we’ll use lemons. 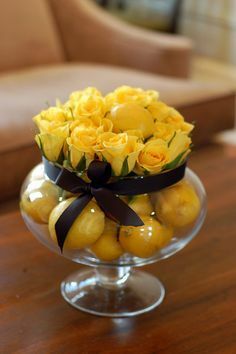 Place the small fruit in the vase. Fill with juniper cuttings, lavender cuttings, rosemary cuttings, anything hardy and tall will do nicely; then fill with water, and place on a doily in the center of the table, and then if you find it blocks your view or clutters your dinner table, simply move it to the sideboard if you need to. Now let’s take a little creative breather and make an individual centerpiece. Let’s take our little bird and nest and bring them together; try using a twist tie or glue gun or paper clip, etc. to keep them together. Next take a dripless votive and place it in the nest. If there is room per setting, lie all of this on top of a few leaves or a doily and place one in front of each persons setting. For our most ornate dining centerpiece, let’s use our elongated planter. We have one in brass which will do nicely. Afterwards, when the candles melt and we remove them, we can reuse the planter…maybe for our springtime, indoor bulbs which we showed you how to do a few issues back. Now, place the elongated brass planter on two doilies on the table which it will festoon. Let’s begin to build it. By placing it on the table, we will be better able to gauge the proper height and ornamentation. Now, let’s wrap a faux maple leaf vine around it to bring out some copper autumn color and to compliment the brass planter. We just looped it to hold it together, you may need a tiny twist tie or pipe cleaner if the vine doesn’t quite work within itself. Next, take your candles; pillars, medium sized tapers and line them up within the planter. Once you have placement, lift each, at a time. Take a completely different candle and light it for its wax. Let candle wax drip down into the planter and then place the candle into the hot wax for a more secure placement. 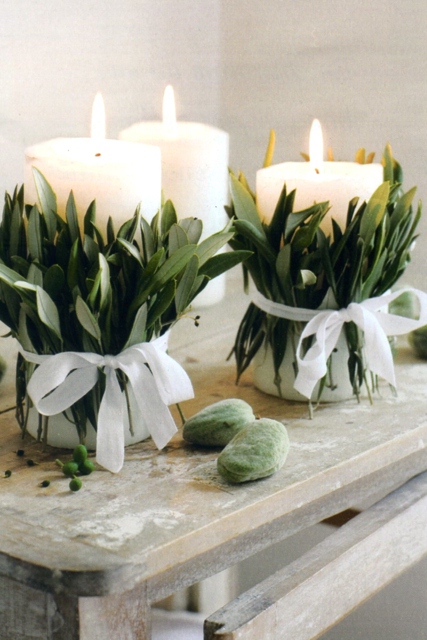 Next, to fill the vacant space between the candles, if you have any, pour the vase marbles around the candles. This centerpiece, because of all of the candles in a row, is a great show stopper, and will add a lot of festive dimension to your already wonderful crystal and china setting. Just remember, when all of the centerpieces are finished and it is time to reuse them, don’t scrape the wax off of anything, use really, really, hot water and the wax will melt away, and of course, be careful not to scald yourself with the hot water. 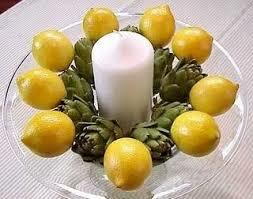 Well, there we have it, quick, lovely, super easy and memorable Thanksgiving centerpieces. Happy, memorable centerpieces and Happy Thanksgiving! And for others around the world who couldn’t find a pumpkin or a turkey if they went to their corner market, Happy Harvest centerpieces! 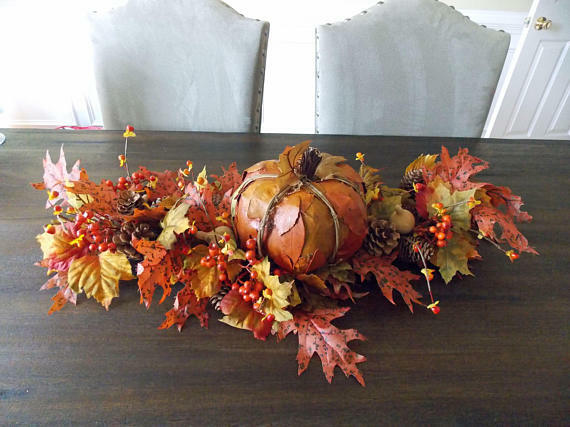 These centerpieces do very well decorating any festive autumn dinner table. Next : ASSISTED LIVING FACILITY HONORS VETERANS!